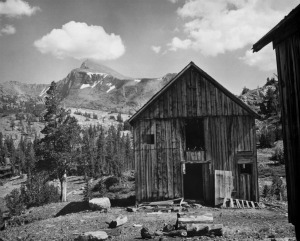 Sierra silver mines required the building of wagon routes for the delivery of food and supplies. One of these would become the Tioga Road. The Tioga Road has been called "the road to broken dreams"...and perhaps it was true. The deep-felt longing for contact with the wilderness. Long before silver was discovered there, trails have existed across the Sierra where the first large mammals tromped across it hundreds of thousands of years ago. Native grazing animals like the mountain sheep, deer, and even bear still wander up and down the Sierran slopes searching for tender young shoots as the snowlines recede. Animals also travel over the mountain passes seeking salt. As John Muir noted..."especially in rugged and inaccessible terrain the trails of white men, Indians, bear and wild sheep, be found converging in the best places." The next to use the trails were the Indians, whose artifacts collected at sites near El Portal show unmistakeable evidence of trans-Sierran trade with neighbors from as early as 2,500 BC. The Indians did not make these trips for pleasure...they were interested in trade. Acorns, berries, beads, paint ingredients, and ornate baskets were exchanged by the Miwoks for the Eastern Mono's pine nuts, pandora moth larvae, fly pupae, baskets, rabbit and buffalo robes, salt and obsidian. 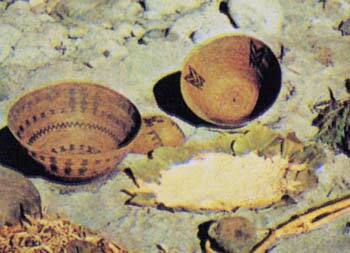 The discovery of ancient “trade materials” not occurring west of the Sierra, allow us to trace the early Indian paths. And today's Tioga Road, follows these early aboriginal trade routes. 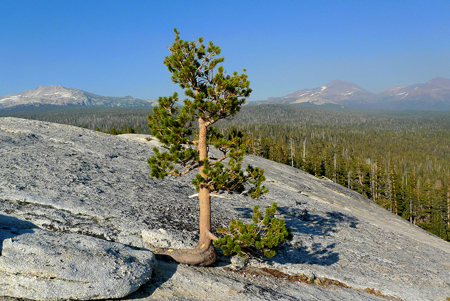 The Indian footpaths from Crane Flat through Tamarack Flat pass by Tenaya Lake and then through Tuolumne Meadow. 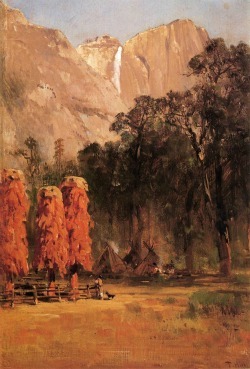 These would later be used by the first party of non-Indians to travel through what would become Yosemite National Park. The Joseph Reddeford Walker party used the Indian trails, even though they were covered with snow at the time. Walker's group endured great hardships while taking more than a month to make the crossing over the Sierra from Bridgeport Valley to the San Joaquin Valley. It was there that they made an exciting discovery. During the pursuit, Lieutenant Moore noticed "rich-looking outcrops". Among those who saw Moore's samples upon his return to Mariposa was a man named Leroy Vining. Lee Vining would lead a group of prospectors over the Sierra via the trail to Bloody Canyon, prospecting along the route. Although Vining eventually settled in what is now known as Lee Vining Canyon, he did no mining. Instead, he homesteaded about two miles up-canyon and built a sawmill, supplying lumber to the region. 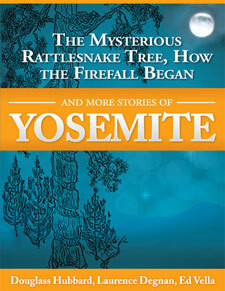 Lieutenant Moore's expedition reports from 1852 also caught the eye of writer and entrepreneur James M. Hutchings, who began publishing a small newspaper promoting the Yosemite area, as well as providing guide services and overnight accommodations for travelers to Yosemite Valley. 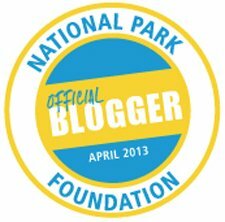 The public interest in mining in the Sierra was kindled, leading to the development of a more established trail in 1857 from Big Oak Flat and through the Tenaya Lake-Tuolumne Meadow region. It was blazed and cleared by a man named Tom McGee who followed the original Indian foot trails. The narrow Indian trails proved unsuitable for pack animals as a rule... It was commonly thought that the Indians purposely traveled grounds impossible for white men to follow them in mounted pursuit. McGee’s trail became the forerunner of what would become the Tioga Road. Josiah D. Whitney of the California Geological Survey would come to study the area in the early 1860’s, and his description of the headwaters of the Tuolumne were published in 1865. He noted that the Tioga Pass (which he called MacLane's) was 600' lower than the Mono Pass route and suggested the use of it as an easier alternative crossing point. 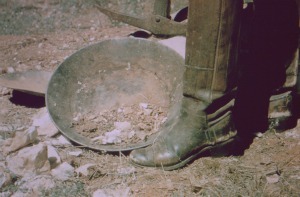 Although Lieutenant Moore's discoveries of gold in 1852 seemed to excite the Mariposa miners at the time, for some reason no mines were immediately begun. Finally, in early in 1860 a rag-tag prospecting party consisting of a lawyer, a sea captain, a surveyor, a dentist and a professor traveled into the Bloody Canyon area...but after a long stay they had found little quality ore.
As they were leaving, one of the party a man named George Chase, left a flattened tin can on Tioga Hill on which he had scratched a location notice with his knife. Fifteen years later while herding his sheep, a boy named William Brusky came across a rusty pick, shovel and the can with the message from the past. He could only make out, "Notice, we the undersigned" and a date of 1860. Brusky had heard the legends of the lost mine…Had he found it? He took samples of ore back with him, but they were worthless. Not discouraged, he returned to the site the next summer and discovered better looking samples. The analysis found these to be rich in silver, and by the next year in 1878, nine claims were already established and the Tioga mining district had been organized. 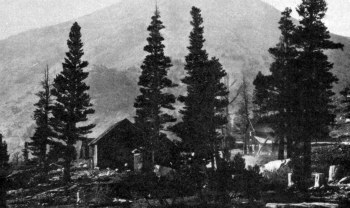 The settlement of "Dana”, the physical site of what would become the Great Sierra Mine, was soon established, and by 1881 the Great Sierra Consolidated Silver Company financed with eastern capital, had bought out every claim on Tioga Hill. On February 25, 1882 excavation of the Great Sierra Tunnel was begun, and first digging by hand, it quickly became clear that drilling machinery would be needed. The word was out and prospectors swarmed the area. More than 350 claims would soon be made in the Tioga District alone. The town of Bennettville was touted as "an excellent location with ample room for 50,000 inhabitants, an abundant water supply and invigorating climate". On March 13, 1882, the post office was established in Bennettville at the Great Sierra Mine headquarters. They were open for business! 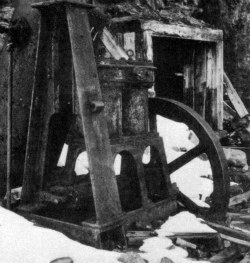 The mine drilling machinery was purchased and the process of dragging it to where it was needed on the east side of the Sierra in Lundy began. “From that point to the south end of Lake Oneida, a distance of about two miles, is a rise of 845 feet, most of it in two hills aggregating half a mile in distance. The machinery will probably be hoisted straight up to the summit of Mount Warren ridge from the southwest shore of Lake Oneida, an almost vertical rise of 2,160 feet. “The machinery consists of an engine, boiler, air compressor, Inqersoll drills, and iron pipe, for use in driving the Great Sierra tunnel. It is being transported on six heavy sleds admirably constructed of hardwood. Another, or rather a pair of bobsleds accompanies the expedition, the latter being laden with bedding, provisions, cooking utensils, etc. The heaviest load is 4,200 lbs. 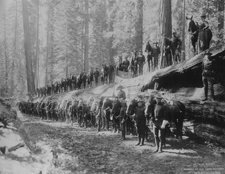 Twelve men, two mules, 4500 feet of one-inch manila rope, heavy double block and tackle and all the available trees along the route are employed in snaking the machinery up the mountain. It would take Kemp and his men more than two months, from March 4 until May to move the eight tons a distance of about nine miles. 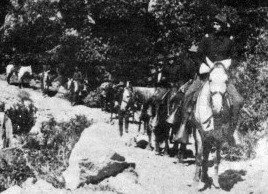 With early expectations for success and with it the need to ship large quantities of supplies, the “Great Sierra” Board of Directors studied various routes for wagon roads up into the mountains and to the mines. Although trail routes had already been established to the eastern railroads via Lundy and Bloody Canyon, this proposed road would cross the Sierra from the west allowing goods to be hauled from the rail-head at Copperopolis via the Big Oak Flat Road. Estimates for the road construction were submitted by Civil Engineer F. Lord in 1881. The cost to build the wagon road from Crane Flat to the mines would be about $17,000. With their own anticipation of riches, the California and Yosemite Short Line Railroad incorporated themselves in July of 1882 in Sacramento. Their plan was to run their trains from Modesto to Mono Valley along Lee Vining Creek or perhaps McLean Pass. Their business headquarters would also be established in Bennettville. Investors from the Great Sierra Consolidated Silver Company organized the company with five million dollars of capital stock and money from the California and Yosemite Short Line Railroad bought the supplies for the survey crew. That Fall the Great Sierra Board of Directors gave the go-ahead to begin the new wagon road and engineer Charles N. Burney was assigned the project with William C. Priest as his assistant. They began the project at once. H. B. Carpenter and H. P. Medlicott conducted the survey. In addition to their road survey, the men were asked to pick a line for the future railroad that was the shortest and most direct route from the east over the mountain range and westward to San Francisco. The survey party advanced as far as White Wolf the first season before snowfall stopped them. 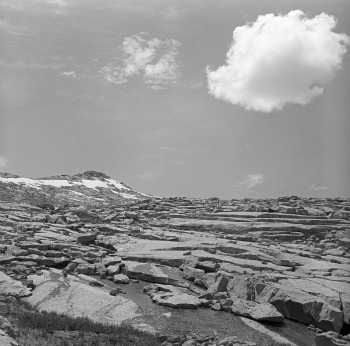 Work was to resume after the melt in the spring of 1882...they reached Tioga Pass that July. The local newspaper, the "Bodie Daily Free Press" noted that Engineer Carpenter's survey was completed from McLean's Pass to Mono Lake Valley on July 20 of 1882. "Now, however, the spirit of civilization in the person of John L. Ginn, Chief Engineer of the Yosemite Short Line Railroad, has planted the survey stakes of a railroad line within a hundred feet of the hermit's door, and it is a mere matter of time when his lonely reveries will be broken by the "shrill whistle of the locomotive." Survey Chain-man John Ferretti recalled meeting John Lembert who was living in a hut that to him "looked more like a bear trap than a place for human habitation". Lembert homesteaded his Soda Springs property in 1885, having spent every summer there since 1882 . “Hermit John” as he was known, eventually left the Meadows in 1890 after being snowbound and losing his profitable angora goat herd. Ferretti was awed by the hermit but finding him "friendly, but saddened by the construction". Once begun, the road construction progressed at an awesome rate. Nearly one-half mile of finished road was turned out by the 160 man crew on that section for each day on the job. The fall of 1882 saw the road advance two miles from Crocker's lodge to as far as the present park boundary before their progress was halted by the winter. On April 27, 1883 work was resumed and the crews worked without interruption until completion of the road on September 4th, 1883. In 130 days of work, the 56 mile stretch had been completed at a total cost of $61,095.22...about $1,100 per mile. "The Great Sierra Wagon Road is rapidly approaching completion. Harry Medlicott's graders from this side have reached the upper end of Tuolumne Meadows, while Priest's pick and shovel brigade from the other side are on Rocky Canyon Creek, leaving a gap between of little more than three miles, all of which is easy grading. Priest's powder gang, following the picks and shovels, reached Lake Tenaya Thursday and will skip the heavy blasting along the margin of the lake for the present and follow up to the Tuolumne River, after which one hundred blasters will be put on to finish the three fourths of a mile along the lake. It is believed that freight wagons will reach Tioga by or before the end of the month. The construction of this road was a stupendous and costly undertaking and the Eastern capitalists to whose enterprise and public spirit the people of this county and coast are indebted for a great thoroughfare to hitherto inaccessible but rich and extensive region, deserve to be remembered with gratitude." The ethnic make-up of the entire construction crews is unclear, but the best records indicate that there were 90 white men and 250 Chinese employed by the company and working at various sites. Pay rates were phenomenal for the time: the Chinese received $1.20 per day, and the Caucasians $1.50...All hands received excellent board. The foreman was James Lumsden, a resident of Big Oak Flat, who was most pleased when his wage was advanced from $1.75 to $2.00 per day in recognition of his initiatives on the road. As Lumsden would put it "Soon after the Great Sierra Wagon Road was completed, a big jollification was held in Sonora with many prominent men of the day in attendance". The Great Sierra would suspend all mining operations, and Dana City and Bennettville would soon join the silent ranks of fabled western ghost towns. No records survive of any ore shipments. But the shipment of special mining equipment purchased for use in the Sheepherder tunnel never got beyond San Francisco and was eventually sold there at auction. "A man who recently came over the Great Sierra wagon road reports it to be in execrable condition. It should be kept in tolerable condition if the company wishes to hold it; but, as a matter of real fact, it should belong to the Government and be kept in prime order, as an eastern outlet to Yosemite Park." Even before the Great Sierra Wagon Road was completed on the west side, suggestions and then surveys for routes down the eastern escarpment of the Sierra had been made. At first only horse trails over the Mt. Warren divide and down Bloody Canyon connected the Tioga mines with the Mono valley. In 1899 the California Department of Highways urged the building of an east-side link into the Tioga route to make Yosemite Valley, the High Sierra, and Lake Tahoe more accessible. A bill, authorizing appropriations for construction of this section was passed by the California legislature, and California Highway engineers recommended the Lee Vining Creek route and estimated a construction costs for a 16 foot roadbed to be around $30,000. The bill would fail to become law because of technical errors. But money for the project became available and the construction of a Tioga Pass - Lee Vining line from the east was begun three years later. 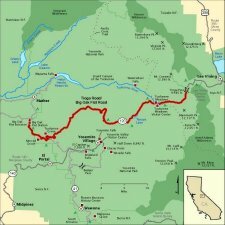 By 1905 all but the five miles immediately east of Tioga pass had been finished at a cost of $39,000. A bid of $23,861 was received for the completion of the remaining section. Soon after the Great Sierra Wagon Road was completed, William C. Priest of Big Oak Flat, upon the recommendation of the Directors of the Great Sierra Company, was assigned the right to collect tolls by the Counties of Mariposa, Tuolumne and Mono. The toll rates established were: Freight teams with two horses - $5; single horses - $1.50; passenger teams…each horse - $2.50; footmen - $1; horse and rider - $2; pack animals - $1.50; loose horses and cattle - 50 cents each; and sheep and goats -10 cents each. 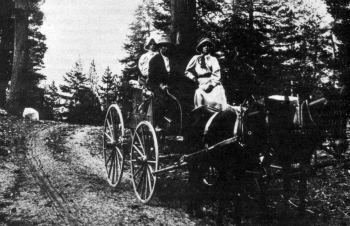 The rates worked out to be 3.5 cents per person per mile, comparing, favorably with the 3.3 cents on the Big Oak Flat Road, 3 cents on the Coulterville and 2 cents on the Wawona. Although technically intended to be a toll route, no collection gates were ever set up though the road saw frequent use by tourists, Army troopers and stockmen. To return to the home page from Sierra Silver Mines please click here. Who Owned The Road And Who Would Maintain It? 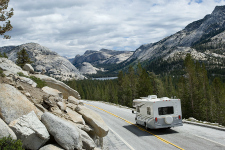 Big Oak Flat to Tioga Pass...High Country From The Car!